Moses Glover, on his map of 1635 shows Lady Falkland living in a house on Twickenham's riverside downstream from St Mary's Church. Probably rented by her son for her use, the house was known as Ragman's Castle, standing at the lower end of what became Orleans Road. This small house no longer exists; it was demolished by the Earl of Kilmorey in about 1850, the land taken into the Orleans House estate. Earlier LifeElizabeth Cary was born at Burford Priory in Oxfordshire, the only child of Sir Lawrence Tanfield (c1551-1625) and his wife Elizabeth, nee Symonds. In 1602 she married Sir Henry Cary and, between 1608 and 1624, she bore him eleven children, six daughters and five sons of whom Patrick, the youngest became a poet. Henry was descended from William Cary, husband of Mary Boleyn, older sister of Ann. He was created 1st Viscount Falkland in the Scottish peerage in 1620. The name referred to the Royal Palace of Falkland in Fife. In 1622 he was appointed Lord Deputy in Ireland. This involved residence there and incurred expenditure which he could ill afford. From this time on Elizabeth was exercised, generally unsuccessfully, to repair their financial fortunes. She passed her substantial jointure to her husband. Her father disapproved of this to the extent that he disinherited her in favour of her eldest son Lucius. On his elevation to the peerage, Henry commissioned full length portraits of himself and his wife by Paulus van Somer (d1621). Henry's striking portrait came into the possession of Horace Walpole at Strawberry Hill (Description of Strawberry Hill, page 51, 1784 edition) where it hung in the Gallery. Elizabeth's is in the Tate Gallery, London, and there is a 19th century copy in watercolour by Thomas Athow. Tanfield bought the Great Tew Estate in Oxfordshire in 1611 and so, when his wife died in 1629, both Burford Priory and Great Tew passed to Lucius. The latter estate remained in the family until the death of Anthony Cary (1656-1694) the 5th Viscount, only being sold to Sir Anthony Keck in 1698. Keck's grandson Anthony inherited the property and also enjoyed ownership of Richmond House on Twickenham's waterfront from 1744. Further difficulties for Elizabeth came when, in November 1626, she publicly announced her conversion to Catholicism, something which angered her husband who attempted to divorce her. Her father had died the previous year, but he had already done his worst by disinheriting her. She may have adopted that faith privately by conviction some twenty years earlier. Charles I, now her monarch, was also displeased and placed her under house arrest. However, after about six weeks she was released, conceivably by the intervention of the Queen: Henrietta Maria was herself a committed Catholic and only recently married to Charles. Self educated, Elizabeth became proficient in a number of languages. According to her biographer, Elizabeth's voracious reading was strenuously opposed by her mother and she was reduced to buying candles from a maid so that she could continue studying at night, privately in her room. 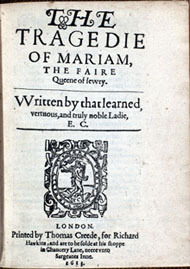 She is best known today as the author of “The Tragedie of Mariam, the Faire Queen of Jewry” (1613), the first original play known to have been written by a woman. Probably written before 1608, it was preceded by a play, now lost, about a tragedy in Syracuse. Mariam was the second wife of Herod the Great, King of Palestine (39-4BC). Elizabeth's earliest work, a translation of “The Mirror of the World” by Abraham Ortelius was made in 1598 when she was about 13 years old. Other works followed, including a verse life of Tamburlaine, the Virgin Mary, the lives of St Agnes, St Elizabeth of Portugal, and St Mary Magdalene, and translations of Seneca and Blosius. 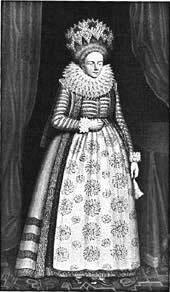 It is not known why, or for how long Elizabeth came to live at Ragman's Castle though it could have been as early as 1625 on her return fron Ireland. Deprived of her inheritance she applied to the Privy Council for support. They directed that she should be given the use of her mother's house, Coates, in Oxfordshire and that her husband should make her an annual allowance of £500. He never paid this, nor did she move to Coates. Thus she lived for some years in penury (“Elizabeth remained in a little house outside London in dire need and wholly dependent on the charity of friends…”.- Writing Women in Jacobean England, Barbara Kiefer Rewalski). Her son Lucius had inherited her birthright in 1629 and the title in 1633 but was himself burdened with debt. He took up residence in Great Tew where he entertained his friends (the “Great Tew Circle”), among whom was Sir John Suckling and Edward Hyde, later 1st Earl of Clarendon. This was no place for Elizabeth. A strong supporter of the established church, he resisted her pressure for him to convert to Catholicism. Her other children were more malleable and Twickenham could have been a quiet enough neighbourhood for her to further her mission to make Catholics of them all. She enjoyed considerable success with this: four of her five surviving daughters were duly installed by 1638 in a Benedictine convent in Cambrai. The fifth escaped, marrying Sir William Uvedale in 1640. Patrick and Henry were sent, secretly and in defiance of an order from the Star Chamber, to the Monastic (Benedictine) School of St Edmund's in Paris. Edward Ironside, Ragman's Castle took its name from a cloth merchant, replacing an ale house known as the Dog and Partridge. Its position on the bank of the River Thames may have given Elizabeth the means to smuggle her sons downriver to Deptford. Once in Paris Henry became a novice with the adopted name of Brother Placid. Patrick eventually returned to England following an unsuccessful novitiate at Douai and renounced Catholicism.